The federal electric vehicle tax credit is beginning to phase out for Tesla. What would it be like if Tesla (TSLA - Get Report) wasn't surrounded by controversy all the time? Hard to imagine, right? The company's latest move has bulls and bears at it again. Tesla says the last day customers can order a new Model S, X or 3 and still be guaranteed the full federal tax credit for electric vehicles (EVs) is Oct. 15. 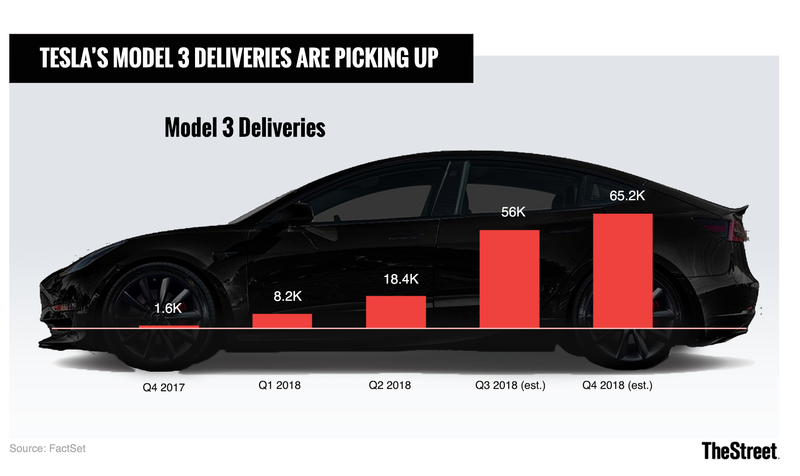 Here's how it works: Once an automaker hits 200,000 EV deliveries in the U.S. - Tesla is the first to do so - then the phase out begins. In Tesla's case, it hit the 200,000 mark this summer. After an automaker hits that mark during the quarter, the $7,500 federal tax credit remains in full effect for the next two quarters (six months). In Tesla's case, that's until the end of this year. However, it will be cut in half to $3,750 for the first six months of 2019, before again being reduced by 50% to $1,875 for the second half of 2019. After that, it will be eliminated. According to Tesla, customers have to order by Oct. 15 to be guaranteed delivery by the end of the year, thus qualifying for the full $7,500 federal tax credit. That doesn't mean if customers order after the 15th they still won't get delivery before Dec. 31. But if they want to be certain they will, and qualify for what is ultimately a large tax credit (assuming they're eligible), they should order soon. What Does It Mean for Tesla and Its Buyers? The EV tax credit isn't a make-or-break scenario for Tesla, but it is something to keep in mind. Many may not think that a $7,500 tax credit means much when a customer is in a position to spend more than $100,000 on a vehicle. To some extent, that's probably true. But considering that a maxed-out Model 3 doesn't hit $80,000, we're talking about a credit that comprises almost 10% of the purchase price. A reduction might not even make these buyers flinch much. But what will it mean to those who are waiting for the base Model 3, reportedly starting around $35,000? If these buyers can't afford the long-range Model 3, which starts at $54,000, then that credit likely is more important to them. That could push them into the arms of General Motors' (GM - Get Report) Chevy, Toyota Motors (TM - Get Report) or Nissan (NSANY . Will it deter other buyers? Specifically as companies like Mercedes-Benz (Daimler (DDAIF ), Audi and Porsche (Volkswagen (VLKAY ), BMW (BMWYY and other high-end automakers enter the EV market, will buyers opt for them over a Tesla? After all, many of them have similar (although not necessarily superior) specs to Tesla vehicles and will be eligible for the full EV credit. It may not even matter if the bill in the Senate succeeds, wiping out EVs credits completely. My hunch is that the EV credit reduction will have a slightly negative impact on Tesla, but it won't be a significant driver. If Tesla is going to fail, it will fail for many other reasons other than a reduced EV credit. Despite what many say about Tesla, the company makes great cars. It's gotten this far because of its vehicles, not federal tax credits for consumers. That said, the EV credit was a good motivator to get consumers off the fence and into an all-electric vehicle. But they did not buy the cars solely because of the credit. Consumers buying lower-priced cars may be more swayed by the $3,750 reduction, but higher-end buyers are, in my view, unlikely to opt for a Mercedes or a Porsche over a Tesla for this reason alone. If they prefer those vehicles to a Model S, X or 3, then the full EV credit is an extra kicker, but it's unlikely to be the deciding factor.